I love this Alexander McQueen Black Cotton Canvas Edwardian Jacket $2,500 black cotton canvas hipped fitted with draped hip detail. Visit Alexander McQueen. The famous Bourgie lamp, created by Ferruccio Laviani for Kartell, is presented in limited edition for Christmas 2011 in three new versions: titanium, fuchsia and sky blue. The fuchsia lamp, priced at Dhs2,440, is available at Kartell, 746 Jumeirah Beach Road. Hurry though, the Dubai store only had two sent to them and I’ve already purchased one for myself! Visit KartFurniture. Quirky and fun Coco Clock by Enrico Azzimonti for Diamantini & Domeniconi, prices start at $390. Visit Diamantini & Dominiconi. 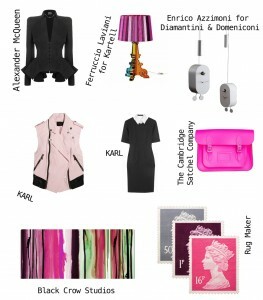 Who isn't lusting over Karl Largerfeld’s new collection KARL? KARL Sless denim biker vest $540 and interlock collared stretch-jersey dress $270 both available at Net-A-Porter. The Fluoro Cambridge Satchel from The Cambridge Satchel Company start at around Dhs500. The Satchel bags are available at Symphony Boutique or Bloomingdales Dubai Mall, or you can order online and your satchel can be personalised. Visit The Cambridge Satchel Company. This wallpaper, created by Black Crow Studios who specialise in custom wall murals & treatments, is uniquely designed to fit your specific size requirements and can be customized to your choice of colour. Prices are available upon request. Visit Black Crow Studios. Rug Maker has officially been granted a licence by Royal Mail to manufacture this exclusive Stamp Rug Collection which fully captures the iconic design of Machin’s Royal Mail Stamps. Prices start from £765, excluding shipping, available at Stamp Rugs.